With the long awaited releases of Fantastic Beasts and Where to Find Them and Harry Potter and the Cursed Child inching ever closer, it’s fair to say that the Harry Potter hype train is officially back in town. 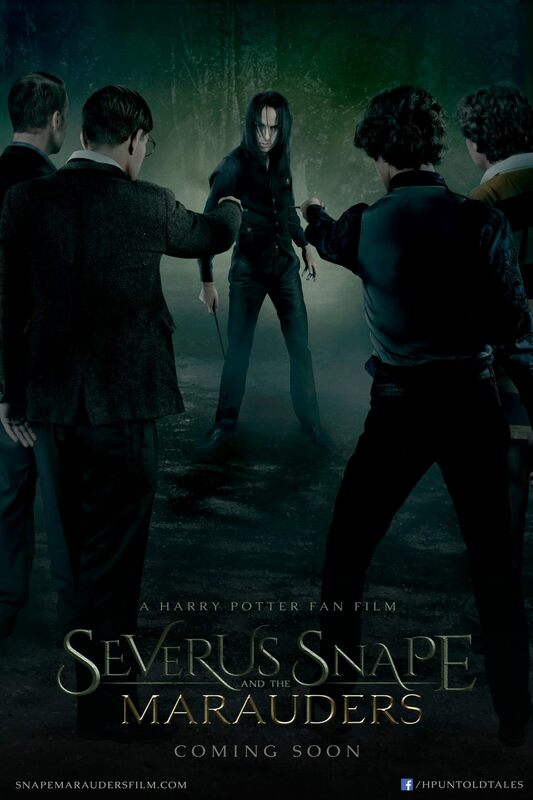 With it comes the highly anticipated Marauders ‘prequel’ Severus Snape and the Marauders, an epic 25 minute short film that follows Snape and the Marauders just after graduation from Hogwarts. We spoke to Director Justin Zagri about casting the perfect Snape, those gorgeous VFX shots and dissecting the semantics of Queen Rowling’s characterisation. The behind the scenes battle of Severus Snape and the Marauders is almost as epic as the film itself – you encountered a major setback when the legal giants at Warner Bros effectively shut down your fundraising sources. How far into the crowdfunding campaign were you and how did this affect not only the project’s funding but also the momentum you had built with fans? Well, the dispute was not really much of a dispute and more of a request. Warner Bros was very considerate in their reasoning with why they didn’t want us to raise more money. Our Kickstarter focused on getting the film produced and shot, while the second one would have covered post-production. So they said we could keep the money we raised, but asked us not to raise more. Considering how hard Liana Minassian the producer and I worked on that Kickstarter, it was much more a relief than anything else. So all post-production was done out of pocket. Because of some incredible volunteers, the film was still able to get done without any decrease in production value, but we did delay our release by two months. We are just grateful they still let us make and release the film. A Marauders film has been awaited by Harry Potter fans since the series began. Is there a reason you chose to set the film after the characters’ graduation from Hogwarts as opposed to during their school years? When I did a survey of what the fans wanted to see next after the success of The Greater Good, the answer was almost unanimously Marauders. Knowing I couldn’t really tell a story in Hogwarts as Los Angeles doesn’t really have castles and building a set would have been just too impossible, I decided their story should be outside Hogwarts. Once that was decided, I took the story from there and asked, who are these guys really? A lot of fans have their own points of view. In fact a whole community have created a point of view that is very interesting. James has square glasses, Sirius and Remus have anything from a closeted crush on each other, to a full fledged relationship. But I wanted to make sure I developed my own point of view based on the facts in the book. From what I gathered, many people in the books had kind things to say about the Potters, a lot of high praise. But when we saw Snape’s worst memory, things became much more clouded. At least for James. What I realized, and this is a credit to J.K. Rowling for her brilliant writing, is that people were describing the Potters in ways that people would do to memorialize someone who passed. Focus on the good memories, suppress the bad ones. There’s no doubt that what Remus, Sirius and others had to say about James and Lily WAS true, but they would hesitate to bring up the bad things In front of their son. It’s the old saying that we thought our parents were gods, until we saw they weren’t. So, putting all this together, I decided that I would tell a story about the Marauders beginning their path into adulthood, when mischief was no longer inconsequential. James would have a trial by fire of his own making, and his trial would be Snape. We would see the beginnings of his transition from a teenager to an adult. The film begins in a very mannered, low key way before exploding into that incredible VFX fight scene. Was there a concern about maintaining audience interest during the ‘talky’ opening scenes? Could you walk us through the processes which enabled you to achieve such an impressive wizard battle? I love fight scenes so much and I was really looking forward to putting together this fight. The best fights tell their own stories in themselves. But to do that, context had to be set up both for fans and non-fans. We needed time to get to know these characters as if they were brand new. Eight minutes may or may not be enough time, I hope it is. 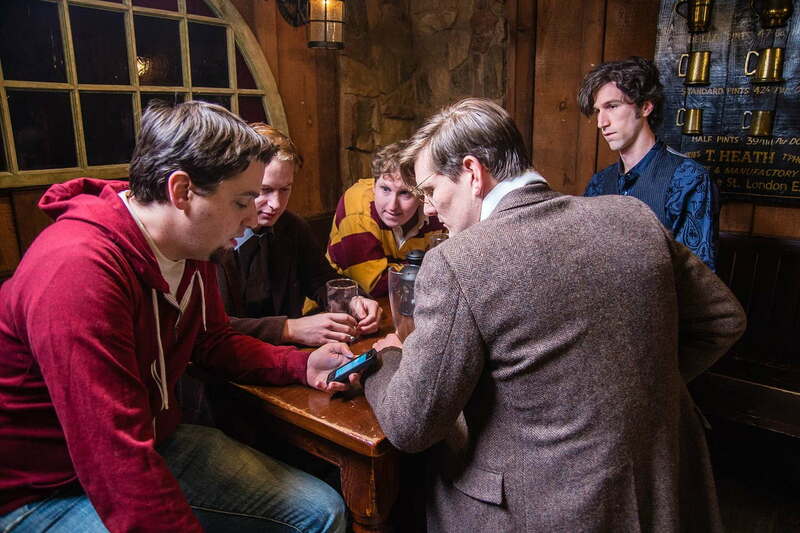 But also, the fans who want to see The Marauders, want to see them un-filtered. In their prime. At their best. They needed to be alone for a while to do that. If I could have afforded a castle, the first thing we would see them do is pulling a prank on a teacher. Or use the map to get through the castle to get Remus into the Shrieking Shack when he is just about to transform. That would require a budget to use animals or CG animals which was just impossible. Since I was really limited on what these guys could do, I wanted them to relax, sit at a bar, and reminisce. The strength of the opening scene with them talking is their chemistry. The actors are so phenomenal with each other, that whenever we would rehearse, a five minute scene would turn into a twenty minute ad lib. I let the actors take advantage of that in the opening minutes of the scene. Up until James asking “You alright, mate?” is entirely ad-libbed. They came up with a story on their own, on the spot, on that day. I had no part in it. All I asked is when they came up with their story, that they stick to it when we move into coverage. So the talent of those guys is what keeps you interested until the meat of the story gets started. As for the duel, that was an entire story of its own. It needed to start with Snape vs James on their own. Right off the bat, I wanted to establish Snape as more powerful. More skilled. But not completely one-sided. James could hold his own, and was willing to raise the stakes of the duel to win. But then I wanted to establish that James wasn’t thinking things through with his decisions. He had a chance to disarm Snape, but instead decided to escalate it. This is when things went bad for him. He was being overpowered, forcing Sirius to aide his best friend. Here, I wanted to establish that Snape was well prepared to face these guys. He has prepared for this for years. Being a better wizard doesn’t necessarily mean being a more powerful one, it just means knowing your opponent better than he knows himself. By the time Remus came in, the Marauders strategy was to overwhelm Snape. Since they came at him as a direct attack, Snape could see what they were using, and could be prepared. When Peter came in, the power of all four of them was enough to out-do Snape. That was one of the themes of the movie. When The Marauders are together, they are unstoppable. And it’s true, cause Snape noped right out of there. Once it was back down to one at a time, Snape used his skills to best them, and it worked. Until he was surrounded. He couldn’t keep track of everyone. He couldn’t see what everyone was doing. He was being worn down. Again, James could have disarmed him, but he wasn’t thinking about that. He wanted to defeat him. Cause him pain. Put the fear in him. What he didn’t count on, was the pure emotional rage that would come from Snape. He was being taunted, pushed, cornered. A cornered animal is when he is at his most dangerous. And then he channeled on the pain of his anger from his worst memory and his rejection from Lily, and exploded. Much like Voldemort did when he was dueling three other wizards and saw Bellatrix get killed. It was sort of inspired from that moment. After it was all shot and edited, VFX took over and did some amazing things. Some of it was directed by me, some of it was ideas by the artists. Jake Akuna did the huge figure-8 shot and the entire lightning shield sequence. He created some awesome spell work in the shots just prior to all that. Navid Sanati did over a hundred shots, and the fiendfyre by Julian Rodriguez took almost 6 months to complete. While the VFX shots are unquestionably impressive, it’s their combination with sound design and score that really sells the reality of what we see. What was the brief you set out for composer Alexander Arntzen and your sound design team and how did one influence the other? I have worked with Alex since he was just about to graduate high school. He has scored all my films since I was in college. That’s 6 films now. He is a prodigy and will be the next Howard Shore. Jordan King did the sound design and really killed it. All the subtle things like walking, rolling around in dirt, breathing, he added in – no one will notice but they took just as much time as the spells and fire and everything else. For me, the score was important to support the emotions of the moments, and really get our chance to put together something that creates a swell of excitement. I mean how often do you get to make an action scene? But what always stands out for me is the music after “I hope to see you again” and the full marauders theme literally being combined with Snape’s theme when the duel is at its peak. There’s been a fair amount of controversy surrounding your portrayal of James Potter, and you’ve previously mentioned that Snape is your favourite character. I personally really enjoyed the characterisation, but what would you say to those who disagree? People who think I got James wrong will roll their eyes no matter what I say hahaha. They have their own version of James, I have mine. And their version is just as right as mine, because there is so very little information on James. So much is left to interpretation. Having said that, I spent just as much time figuring out James as I did Snape. In fact, this movie is secretly about James. He is in his own way, the protagonist. Snape is also the protagonist, but then shifts to become the villain. At least briefly. It’s all very complicated. And Snape is my second favorite character. Dumbledore is my favorite. I love them both because they are both so mysterious. From book one, you knew there was much more to these people than Rowling was letting on, and she kept it that way until the final chapters of the final book. The reason I love Dumbledore more is because of his compassion and kindness. I’d want to hang out with him. Learn from him. Be him. I don’t want to be like Snape. He is bitter, resentful, callous, cold. Makes for a very interesting character on paper, but would you want to hang out with him? Would he even let you hang out with him? Probably not. So back to James. James, to me represented the reality of Harry’s parentage. That his dad wasn’t all he was cracked up to be. We have all experienced this with our own parents. They weren’t perfect growing up, and we often will never know the details, but we do find out over time that they had their own issues growing up, as we all do. He was arrogant, cold to people he didn’t like, he was fine with stealing (knicked the snitch he was messing with in the memory), and objectified Lily – “Go out with me, and I’ll leave Snivvey alone” – at least as a 15 year old teenager. Now, as a 17 year old, graduating Hogwarts, having been made head boy, and in a new relationship with Lily, there was evidence that he had matured. But, Rowling did say that he would still hex and curse Snape any chance he got, behind Lily’s back while they were dating. So that led me to believe that James had started maturing, but when it came to Snape, still had a lot to learn. So this story was about his transition into becoming a real man. One who takes real responsibility for his actions. James’ excuses for attacking Snape were actually to me, well justified. He knew why he was there, he wanted to talk to Lily. He didn’t want that because he knew of his previous relationship with Lily, but on a larger scale, he knew Snape was going to become a Death Eater, and as far as he was concerned, was now the enemy. So when you decide to fight for the people you care about, you become capable of a lot of things. Even dark magic. BTW the biggest criticism I get, James didn’t like dark magic? Would never use Fiendfyre? Again this is fan fiction and merely my interpretation, but keep one thing in mind. Harry used the Cruciatus curse. Twice. First time he didn’t mean it. Second time he definitely did. And that’s an unforgivable curse. You’ve described the production of The Greater Good as being “two guys and a camera”. How did your approach on the two projects differ? Snape and the Marauders was a full fledged production. Mind you it was still voluntary, but we got all the toys this time. 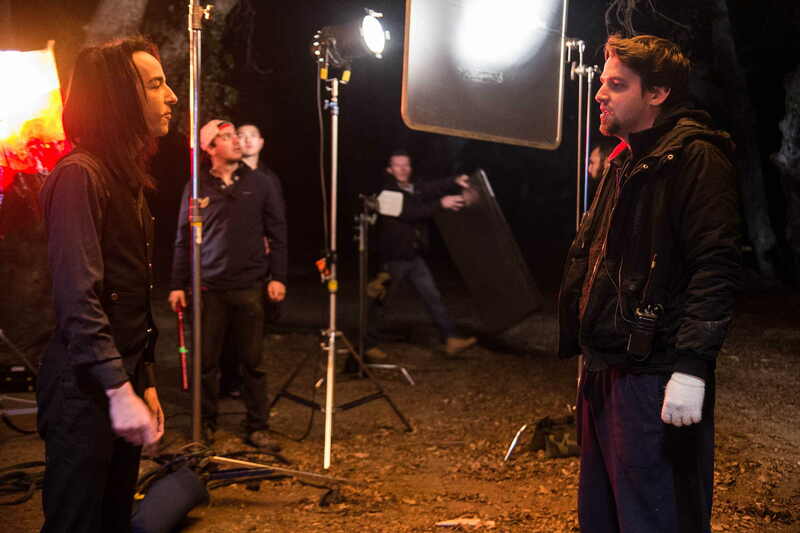 Shooting at night and making sure people are well lit is quite the endeavour, so we got a giant crane that had about 200K watts shining down, big reflectors, dimmers, the works. Same with bar, more toys. We also had two cameras, both RED, one dragon, one epic. We also had dollies, and much of the duel was shot on steadicam. A lot of awesome shots turned out amazing without direction on my part because the steadicam op knew what he was doing. The Greater Good, with just under 4m views, has garnered a frankly huge fan base for your work. How did you go about marshalling that audience over to Severus Snape and the Marauders? Well the fans asked to see these guys, so that’s what I went and did. And from the moment I revealed the very first teaser poster, I kept the fans up to date with everything we were doing. I revealed my cast picks one by one and gauged their reactions. I gave them ideas on what the story would be. I told them up front that this movie would be mainly about Snape. And while there have been some vocal detractors, the response on the whole was overwhelmingly positive. I did the best I could to respond to fan’s questions, and I made sure they felt like they were part of the process. The film literally wouldn’t exist without the fans, so I have them to thank for that. As for what I learned from The Greater Good, I learned to take my time with the writing process. I went through a lot of drafts to get these characters where I thought they should be, and wanted to make sure each one had clear motives and conflicts. I also wanted to make sure there was a central theme for the story, and how each character revolved around that theme. I wanted to make sure each character had something to learn, whether it be positive (James admitting it was his fault) or horrific – Peter’s beginnings of betrayal, Remus getting Sectum Sempra to the face. Poor guy, he’s my favorite Marauder. It’s the best way I could think of to show Snape was capable of being truly evil. As far as promotion goes, we went all the way. 8 posters, 2 trailers, the works. Janie Walter did an amazing job with all those posters. Do you plan to revisit the wizarding world through film any time soon? What new projects do you have on the horizon? Man I would love to keep making fan films, but there’s a few problems with that. They don’t pay, and they cost a lot of money to make on this level of production value. Since WB won’t let us raise any more money, then my options are very limited. We are considering a radio drama to continue the story, answer a few questions the film left us with, and begin James’ arc into the noble, heroic man that thrice defied Voldemort. As of now, I’m hoping this film will show people that I can make a good movie, and will trust me with an original movie, which is a sci-fi romance about multiple universes. 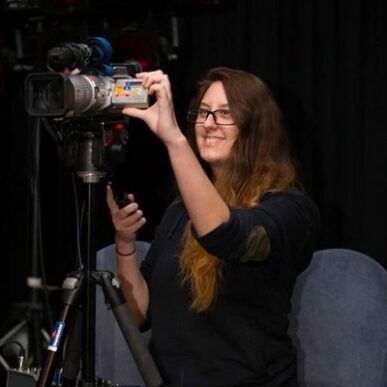 Chantelle is a geeky film student currently chasing down any and all experience possible in the industry. You can offer her some at @ChanMakesFilms.